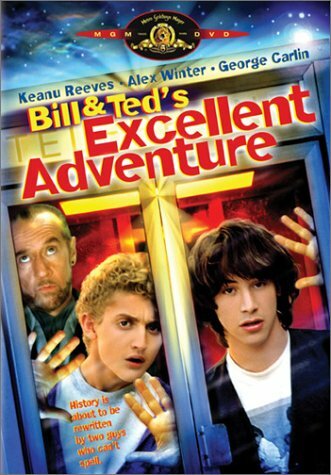 Man, I wish I had a time machine to take back all those claims that this was going to be coming out”tomorrow”. Yes, I did just turn my own hectic scheduling errors into a lead-in joke. Deal with it. 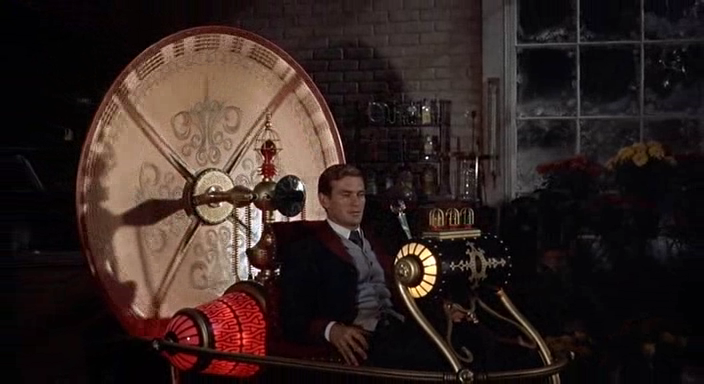 Anyway, Time travel. One of the great tropes of Science Fiction. Is it any surprise that Bizarre Baseball Culture also now features time travel? 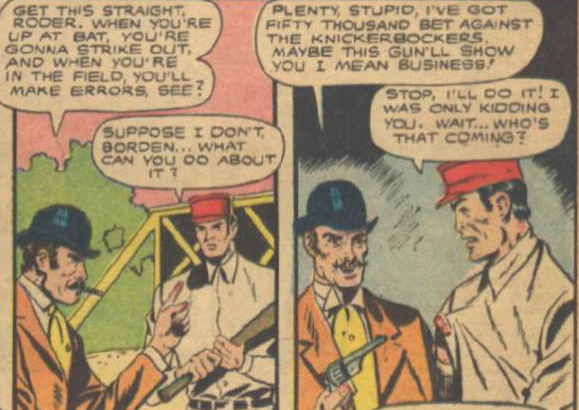 Yes, it’s time for a tale featuring a dude named Stuart Taylor, who, along with his companions Laura and Doctor Hayward, travels back to the age of the Knickerbockers baseball team (sort of). 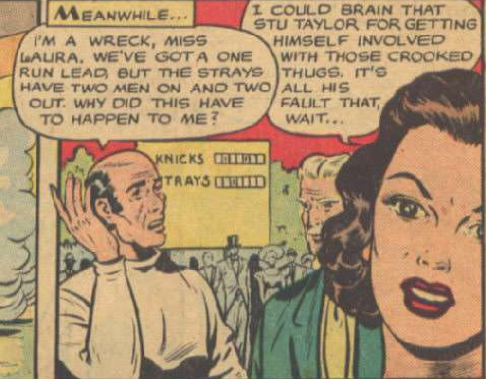 The story from Jumbo Comics #135 (May 1950) can be found here, starting on page 29. Go below the jump for the rest of this article. The writer is unknown (it could be Curt Davis, who’s name is on the page… but given the practices of the time that could also mean he just created the character, and, as I mention below, it probably is that), but the artist is Jack Kamen. One interesting thing about him is that his son, Dean, would go on to invent the Segway. Seriously. Oh, wait, but that Curt Davis, the guy who may or may not have written it? That’s a pseudonym. You see, “Curt Davis” wrote for Jumbo Comics in it’s earliest days (it was one of the first books of the “Golden Age”, first published in 1938, only a few months after Superman’s first appearance in Action Comics #1), including the first stories featuring a Doctor Hayward. 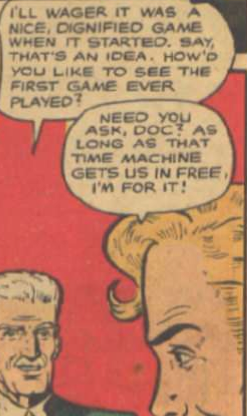 By 1950, however, “Curt Davis” no longer could have been writing these tales, presumably, because he was writing for various other companies and was known by the name “Jack Kirby”. Kirby is arguably the most important individual in the history of American comics, known as “The King” due to his influence. He created or co-created, amongst many others (takes a deep breath): Captain America (with Joe Simon), the Fantastic Four, Hulk, Iron Man, Thor, Avengers, the (original group of) X-Men, the Silver Surfer (with Stan Lee) and DC Comics’ “Fourth World” characters, most notably Darkseid, who is more-or-less the biggest villain in DC Comics. His career history with his collaborators and the companies he worked for were… complicated (from what I’ve read, he and Stan Lee were either good friends or hated each other’s guts, depending on the day) and sometimes litigious (Kirby’s estate has had legal actions against Marvel over the characters he co-created). 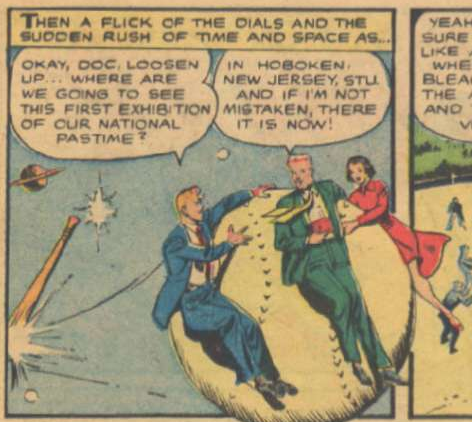 But his influence cannot be denied and I had to mention his connection to this comic, despite the fact that by 1950s he was writing romance and science fiction comics elsewhere. So, off they go to the first baseball game ever. Of course, that’s a rather loaded question. When was the first baseball game? After all, sports named baseball have gone on for years, and the origins are deliberated about to this day. So, what will it be? Will it be the 1846 game between the New York Knickerbockers and the New York Baseball Club? Will they go to the fictional Abner Doubleday game of 1839? Oh, many, so many anachronisms here. For one thing, really early baseball players wore straw hats, not caps. For another, those bleachers in the background look pretty modern for 1833. The gambler is betting 50,000 dollars on a sport that shouldn’t even be being played yet… and $50,000 in 1833 is almost 1.5 million dollars today, making it even more ridiculous. Oh, and I think that type of gun he has didn’t become common until the 1850. I’m pretty sure the bowler hat wasn’t in fashion in 1833 either. 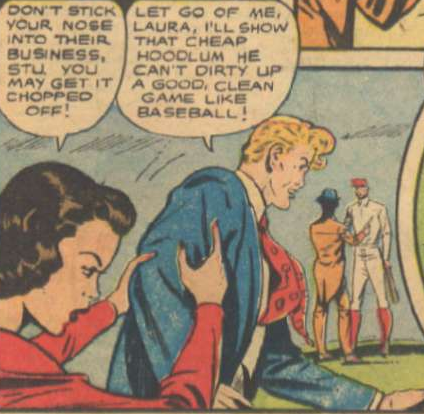 “I’ll show that cheap hoodlum he can’t dirty up a good, clean game like baseball!”, coincidentally, is what some have said before launching into some of the less well-thought-out baseball columns of the modern era. 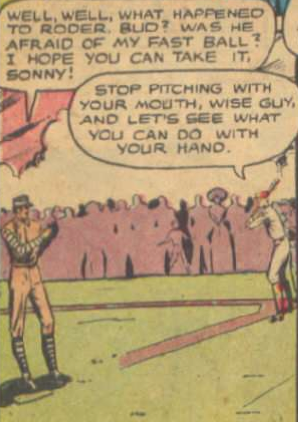 Of course, this brings up a problem, in that while fighting the gambler he knocked the gambler into the ballplayer, injuring him. Great going, Stu. Also, great going ballplayer, for just standing behind the guy who was getting the piss kicked out of him. So, of course, Stuart takes his place. Of course, the rules of early baseball would be completely foreign to Stuart- no balls and strikes, being able to request where the pitcher throws it, no gloves, being able to catch a ball on a bounce for an out…. but, yeah, sure, just throw him in. I mean, they have baseball being played in 1833 with semi-modern uniforms and bowler-cap gamblers with Civil War pistols, what are the odds that the author would actually remember this? Yeah, so much for being able to tell the pitcher where you want it. Oh, and I don’t think the word “bud” existed in 1833, either. I don’t understand how nobody would notice this and, y’know, try to stop it. It’s not like Stu would have been out of people view as he rounded third base. Also, notice how the middle panel seems to take place during the night. 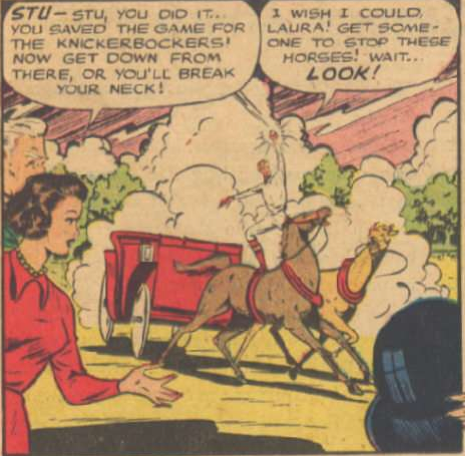 Anyway, we then briefly go into a Wild West comic, as Stuart beats up his kidnappers and takes ahold of their horse-drawn carriage so he can get back to the game. Speaking of which, what is going on at the game? I mean, they must have noticed that Stuart is gone and gotten worried sick. Or, at least, y’know, finally realized that there had been a kidnapping in front of them. Yeah, uh huh. Anyway, don’t worry folks, because Stu Taylor is on his way back… and he catches the ball on horseback to end the game. Okay… now that… is cool. I will give them that. I mean, it makes no sense and I’m sure it breaks a thousand rules, but that is cool. 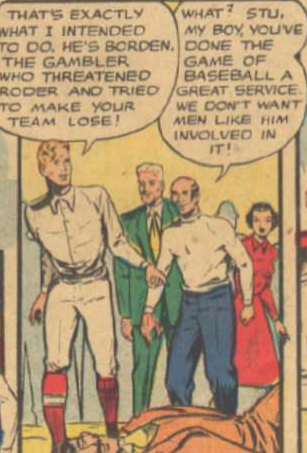 And that, kids, is why no gamblers or shady characters ever bothered baseball again! 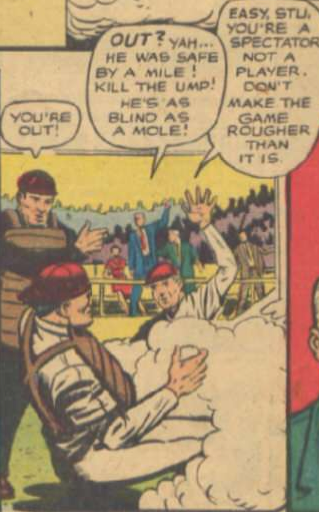 This entry was posted in Baseball, Books and all their spinoffs, Non-Baseball, Uncategorized and tagged baseball, Baseball comics, Bizarre Baseball Culture, Jumbo Comics, Stuart Taylor, Time Travel by danglickman. Bookmark the permalink.